QUEBEC – Montreal’s Osisko Mining continues its highly successful drilling program at the Windfall Lake gold project 100 km east of Lebel-Sur-Quevillon. 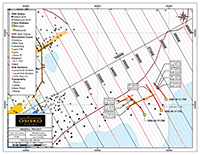 Drill hole locations at the Lynx zone on the Windfall Lake gold property of Osisko Mining. The most recent results from three holes at the Lynx zone include 63.8 g/t gold over 4.4 metres and 50.9 g/t over 4.6 metres in hole OSK-W-799; 42.1 g/t over 9.2 metres in OSK-W-16-792; and 17.0 g/t over 17.3 metres in OSK-2-788. The Lynx zone was recently discovered to the east of the main Windfall deposit. It has been intersected between 60 and 330 metres below surface over a strike length of more than 300 metres. The zone is open laterally and at depth. More drilling will be done to evaluate the abundance and true thickness of the veins and silicified bands in the zone. The current 400,000-metre drill program combines definition drilling above the Red Dog intrusion, expansion drilling above and below Red Dog, expansion drilling to the northeast of the main deposit, and exploration drilling on the greater deposit and Urban-Barry project area. Additional information including a presentation about Windfall is posted at www.OsiskoMining.com.